Frances L.! 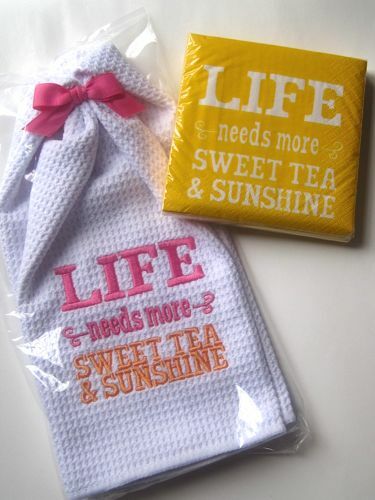 And Frances, I've got your address so I'll get these "Sweet Tea and Sunshine" napkins headed your way. Congrats! Something has occurred to me about my teacup collection that I should have realized a lot sooner: my favorite ones all have memories attached. This beautiful English bone china set from Royal Dover was a surprise gift from the Williamses, the lovely couple who were my landlords for about 17 years before I got married. I rented their wonderful little cottage that shared a driveway with them, and they took care of all home maintenance, grass cutting, held my mail when I went on vacation — they were such blessings to me in my single years! One day, Mrs. Williams knocked on the door. Since they were occasionally in the house replacing air filters and such, she had noticed my collection of teawares. She said she was cleaning out and thought this teacup looked like something I would like. She was wrong. I didn't like it, I *loved* it! The shape, the roses, the pretty peach-pink background color. I still think it's one of the prettiest teacups I own. 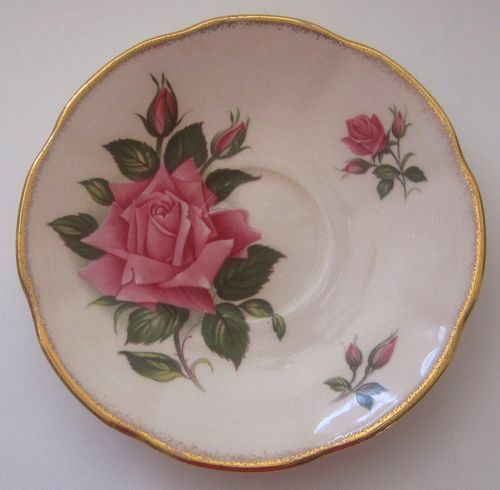 Even the saucer appeals to me because of the large, lush rose on one side, the smaller ones on another. I've been toying with the idea of renting space at a local antique mall to handle some of my teaware overflow (and let's be honest: to allow me the space in my house to shop for more!). 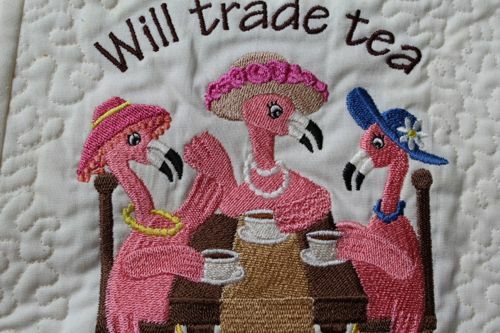 As I looked around the house, I realized that I rarely am attached to something I bought for myself, but the teawares I received from others? Priceless! How about you? 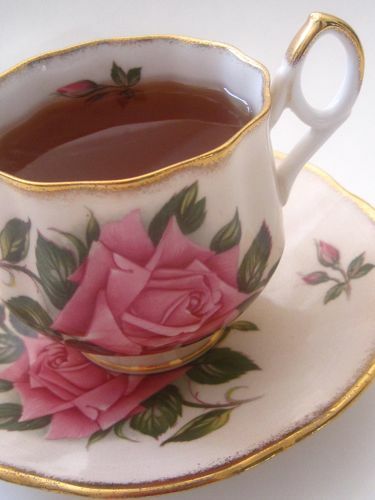 Do your favorite teacups have memories attached? One of our local drug stores, Lee-King, has one of the greatest gift selections in town. I was by there this week and came across this new design on a tea towel and some paper napkins. 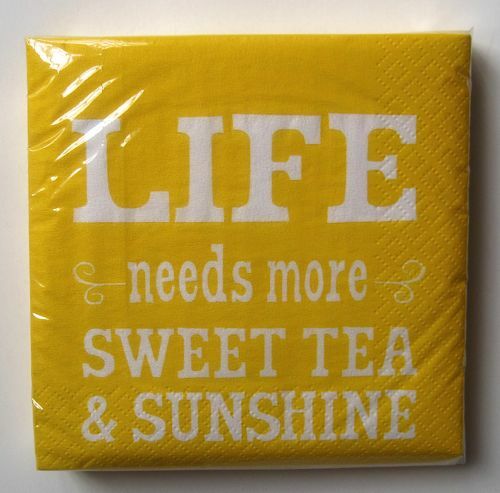 "Life needs more sweet tea & sunshine." 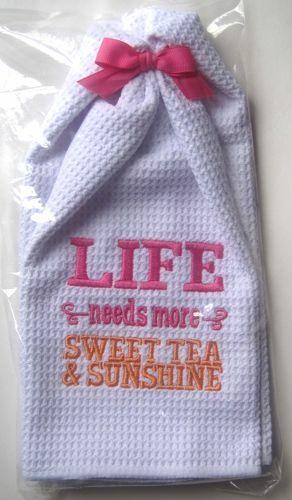 That is certainly my motto, and I decided this cheerful tea towel will help me get through the rest of winter since the weather has turned cold here again. 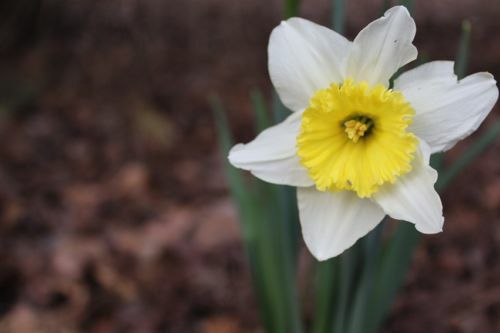 It ought to be a rule that after the first jonquils appear, freezing temperatures have to go away, right? At any rate, I decided one of you might be cheered by this package of sunny yellow napkins with the same saying that's on my tea towel. If you'd like to win the napkins, just leave an "Enter me" to this post by tomorrow morning at 7 a.m. and you'll be entered to win. Giveaway open to residents of the U.S. and Canada. Good luck! About two years ago, I began to notice some of my kitchen linens were missing. Naturally I assumed my husband was responsible, but I couldn't figure out why he needed my favorite oven mitt or that nice thick potholder or that pretty Williams-Sonoma apron I got as a wedding gift. All I knew was, I was putting things in the kitchen cabinet drawer that holds other linens, but then later I couldn't find them. What on earth was happening? This week, I went to the kitchen cabinet by the stove and pulled out the bottom drawer containing the plastic bin where I organize my heart-shaped cookie cutters. When I tried to close the drawer, it would go only halfway. Had something gotten wedged behind it? Um, yeah. I finally got on the floor and took the drawer off its casters so I could see what was hiding in the back of this cabinet. Like a magician who pulls 37 scarves out of a hat, I removed two full-size aprons, three oven mitts, one dinner napkin (THAT's where it was! ), five terrycloth dish towels, and six potholders. 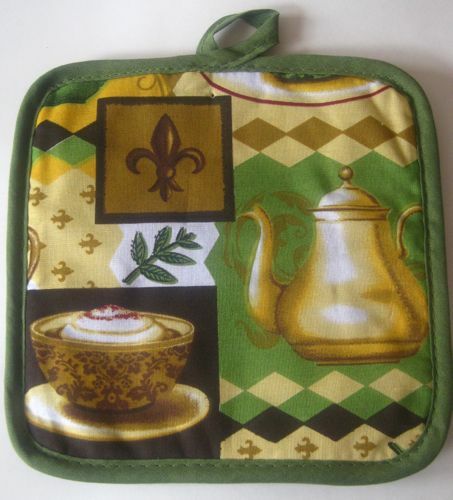 And of all the things I discovered, what I most appreciated finding was this wonderful embroidered potholder! 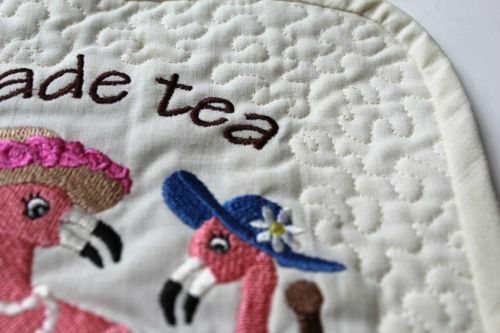 When I worked at the local newspaper years ago and started writing columns about my passion for teatime, a thoughtful woman named Betty showed up one day with this terrific potholder she had embroidered for me on her sewing machine. Betty loved to stitch up all kinds of whimsical things, and she showed up with gifts on quite a few occasions. One day I even asked her, "Betty, why are you sewing all these beautiful things and then giving them away?" And she said, "Because it's fun!" Her work was just so lovely, like the pretty quilting that graces this potholder, and I always felt honored to receive something she'd made. I haven't seen Betty in many years, but I hope she's still stitching away and having fun, wherever she is! And I'm very, very glad to have solved the Mysterious Case of the Missing Linens. Who knew the space behind a cabinet drawer could hold so much! 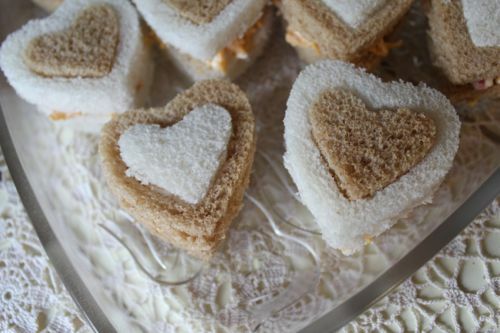 ... a Heart-shaped Cheese Ball. Easy, easy, and easy! The cheese ball is the old standby recipe: take two (8-ounce) packages of cream cheese, about eight ounces of drained, crushed pineapple, a half cup or so of pecans, and combine. Then roll in another half cup of pecans. 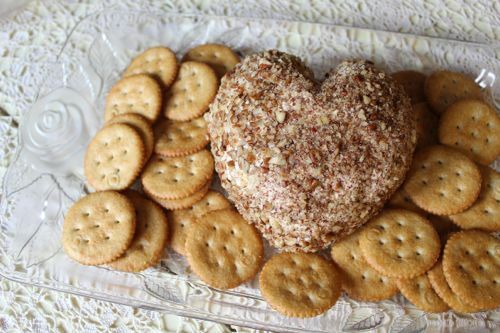 A little dent in the middle and voila, a Heart-shaped Cheese Ball to serve with crackers! 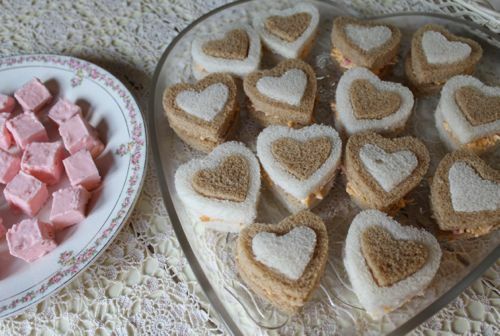 The tea sandwiches I like to make around Valentine's feature heart cutouts using different colors of bread. As long as you have two similarly-sized heart cookie cutters, you're good to go. And the fudge? 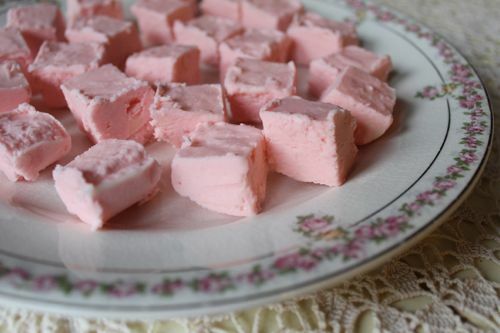 This is that two-ingredient fudge I've been seeing on Facebook a lot. Melt a package of white chocolate chips, stir in a can of strawberry frosting, pour in an 8 x 8-inch pan and refrigerate. That's it. It is too easy to be as yummy as it is. Now I'm thinking of trying it with the new Pink Lemonade frosting I saw the other day. Doesn't that sound good? The weekend's shopping definitely had a blue tint to it, with my greatest find being a new Portmeirion cup and saucer I found at Ross. I've been considering a new fine china pattern that features this shape of cup and saucer, and this $2.49 set seemed perfect for a trial run before I commit to new china. 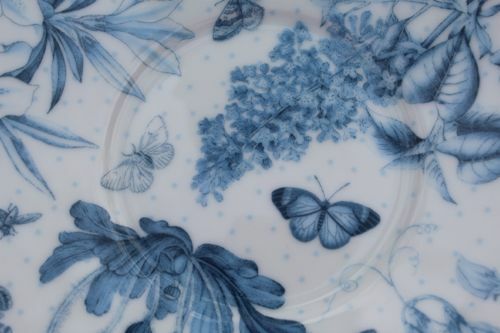 I just love this Botanic Blue pattern, and blue florals have obviously been on my mind lately. 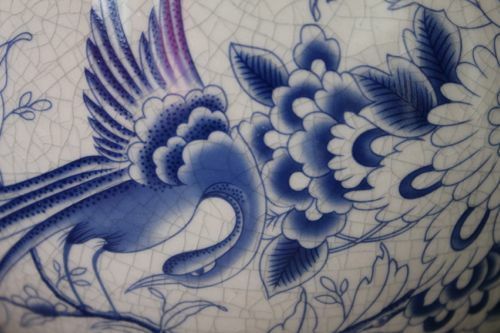 Here's another weekend acquisition, only it's not a teacup. 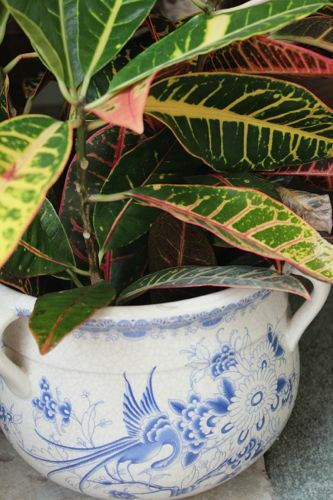 It's a blue and white floral planter, also from Ross. 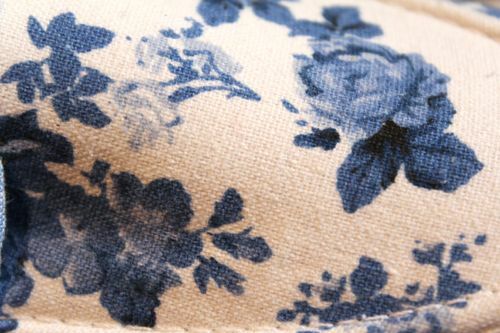 And this blue rose design caught my attention at a most unlikely place, a sporting goods store! I was at Academy Sports in Newnan, shopping for golf stuff for my dad's birthday gift, when I wandered by a rack of these shoes. 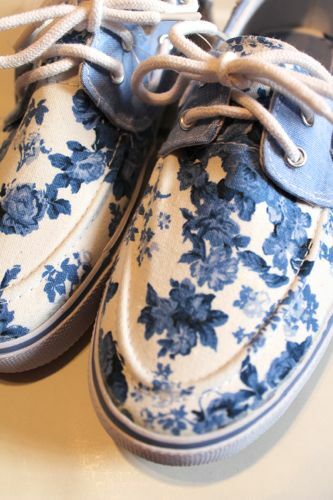 Shoes that look like a china pattern? Count me in! 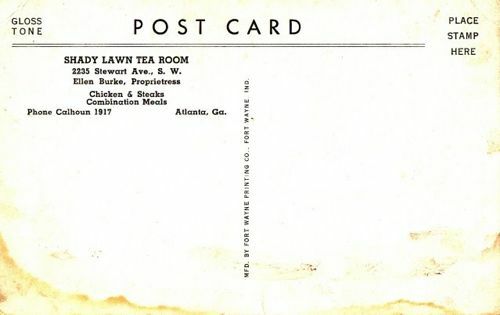 One of these days I'd like to drive to Stewart Avenue in Atlanta and see if this building, which once was home to the Shady Lawn Tea Room, is still there. Now, that is an innocent enough statement unless you happen to be familiar with Atlanta. You see, Stewart Avenue has indeed become known for ladies with shady businesses, but alas, they are not of the tea room variety. I find it a bit ironic, then, that this tea room was known as the Shady Lawn Tea Room. 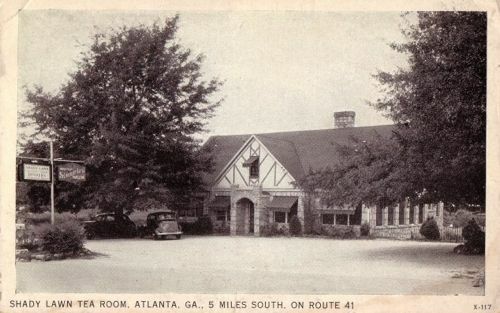 I'll bet the tea room was perfectly respectable in its day, with Ellen Burke, Proprietress, serving up her Chicken & Steaks and Combination Meals. I'm again reminded that some of the early tea rooms were much more likely to serve what I call "country cooking," and I do believe I would have enjoyed dining on Stewart Avenue way back when! 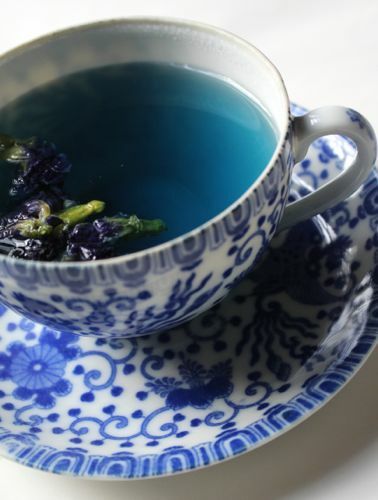 No, that's not Kool-Aid or Gatorade in my teacup, it's a new-to-me type of tea called BlueChai! 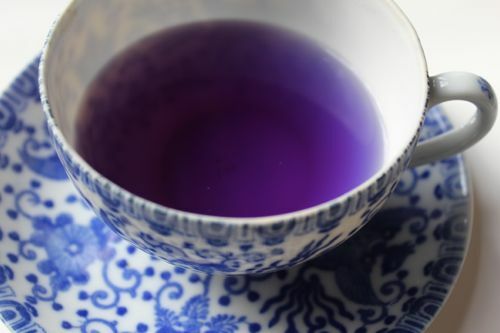 I was recently contacted by the company in Bangkok about trying a sample of this tea, described as "a tasty, blue health tea made from only the best butterfly pea flowers. 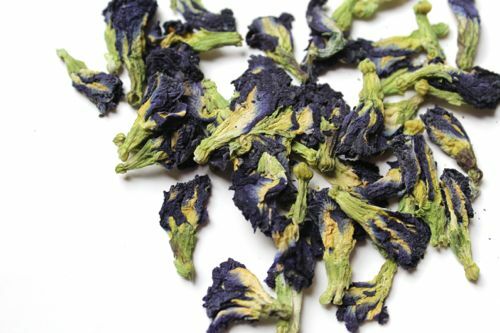 Its rich, refreshing taste combined with the wonderful, intense blue color makes it a perfect tea but it can also be used as natural food coloring for baking, cooking, and drinks." 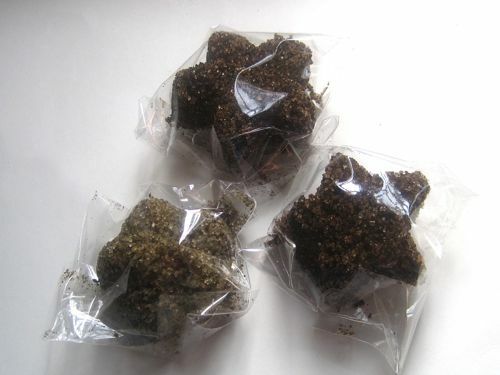 This is what the loose herbal tea looked like when I opened the packet. The instructions said to place 5-7 flowers in a cup, add boiling water, and let steep for 4-8 minutes. 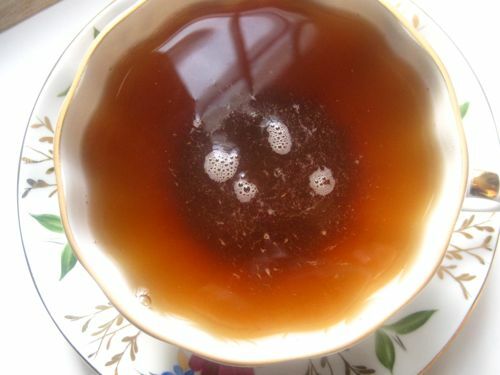 This is what my tea looked like when I first added water. 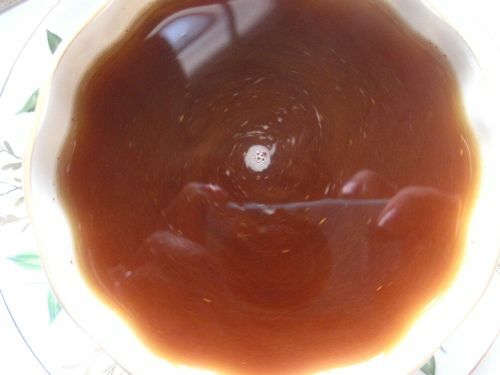 The very first photo up top shows what the tea looked like after several minutes of steeping. I steeped the tea for just four minutes to start with, and it had a slightly vegetal scent with a flavor to match, just the merest hint of a vegetal something. I let it steep for the full eight minutes and the flavor deepened only a bit. Because the flavor was such a neutral with me, I can't say I'd choose BlueChai as a single cup of tea again, but I *would* be open to blending this tea with another flavored tea because of the color! 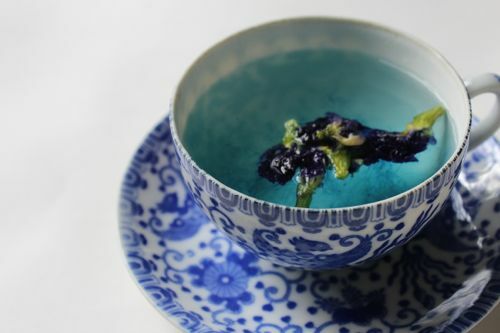 I think the idea of a blue tea is really kind of cool, but my husband looked in my teacup and said, "It's unbiblical." I disagree. Also, the website for BlueChai noted that if you mix a few drops of lemon with the tea, it makes the tea turn lavender, as shown here. Because of its low-key flavor, the fact it's natural and organic, and because of its unique coloring properties, I'm definitely open to further experimenting with BlueChai. You can learn more about it at bluechai.com, and there's also a Pinterest page here. I'd love to know what you think about BlueChai. Would you try it? 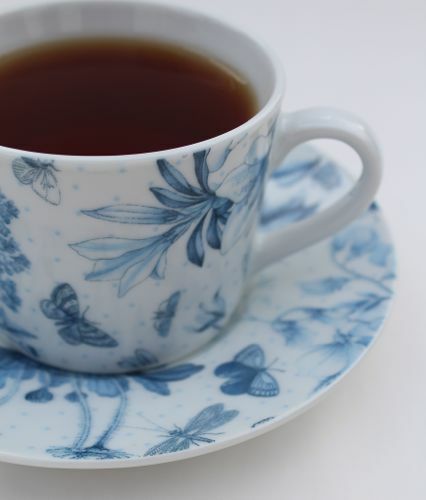 How do you feel about a blue tea in your teacup? 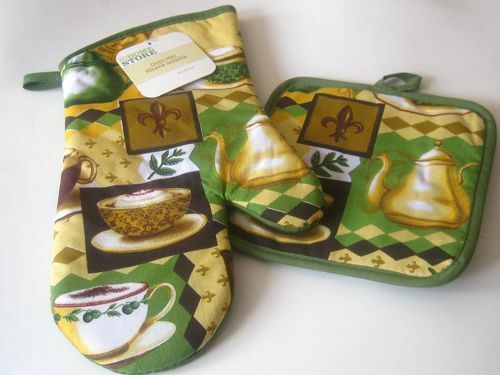 With the green and gold colors and the fleur de lis designs, these would be a good fit for Mardi Gras, wouldn't they? But of course I like the teapots and teacups on them best. No, that's not right. What I like best is that I found both these items at Dollar Tree. 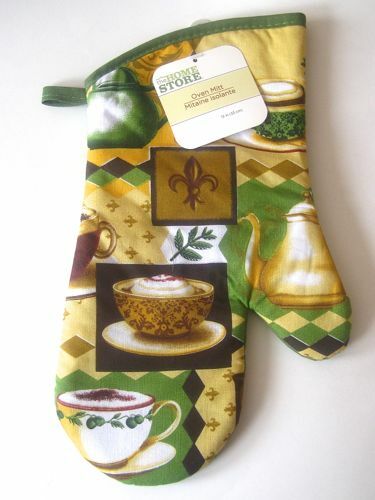 That's one dollar for the mitt, and one dollar for a set of two pot holders. That's a pretty good deal in my book! 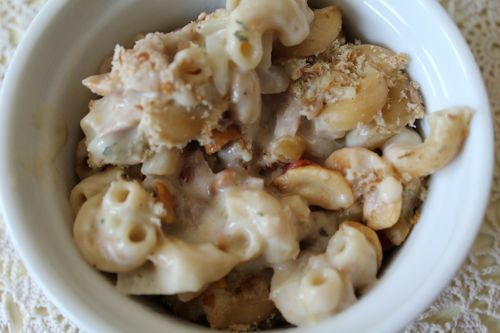 This was easy to whip up, and I made it a little healthier by using whole wheat pasta and substituting low-fat sour cream. I absolutely loved it and will definitely be making this dish again. Here's the recipe as I made it. Preheat oven to 350 degrees. Combine soup, milk, and sour cream and stir. 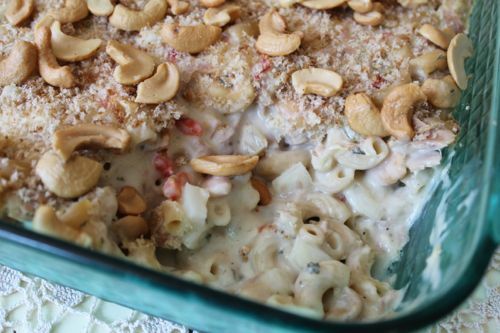 Add tuna, onion, garlic powder, 1/2 cup of the cashews, parsley, pimientos, salt, pepper and noodles. Combine well and pour into an 8 x 8-inch square glass baking dish prepared with cooking spray. Bake for 25 minutes. 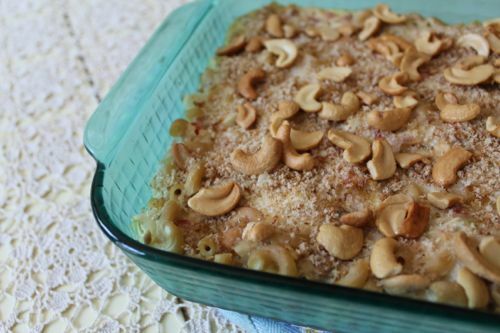 Remove from oven and top with buttered bread crumbs and remaining 1/4 cup cashews. Bake for 5 minutes more. Yields 6-8 servings. 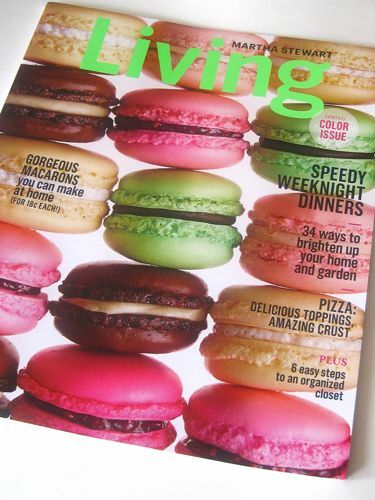 The March 2014 issue of Martha Stewart Living arrived last week, and I must say this cover featuring macarons is one of my favorites they've ever had. Can you not practically hear the crunch of the macarons and taste the creamy filling? I've made macarons exactly twice before, with success both times, largely because I didn't know until after I'd made them that they are said to be exceedingly tricky! Of course my flavors were rather plain (vanilla, strawberry, lime), and this issue of Martha Stewart Living includes flavors that sound a little more exotic: Toasted Hazelnut and Chocolate, Chocolate Mint, Espresso, Vanilla Bean, and Rose Raspberry. 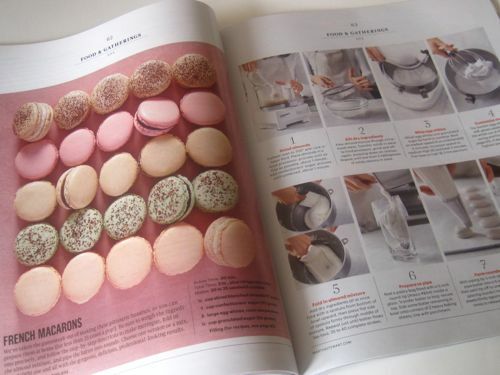 If you haven't made macarons before but would like to try them, this issue's recipes may be helpful, along with the step-by-step photos. 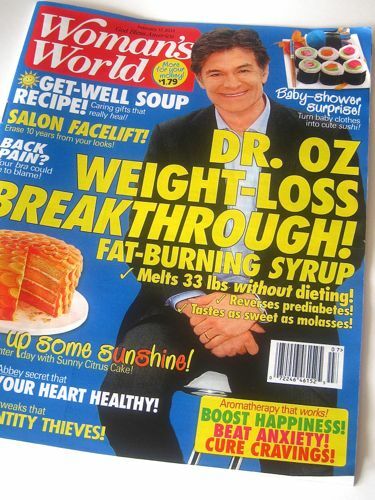 And the February 17, 2014 issue of Woman's World has some things that may be of interest too! See that pretty orange cake on the cover? I love how this citrus-flavored cake has layers and frosting tinted different shades of orange! 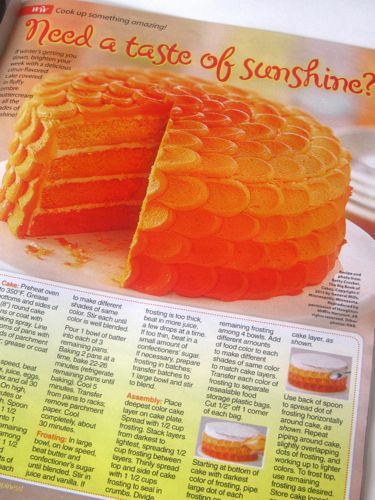 Again, the instructions and photos make this look like a can-do recipe. 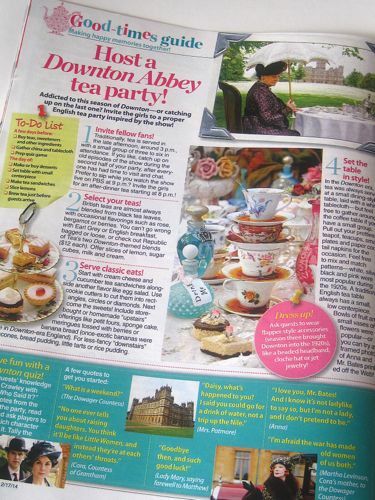 But the thing I *most* wanted you Downton Abbey fans to know is that this issue includes tips on hosting a Downton Abbey tea party! Donna G.! 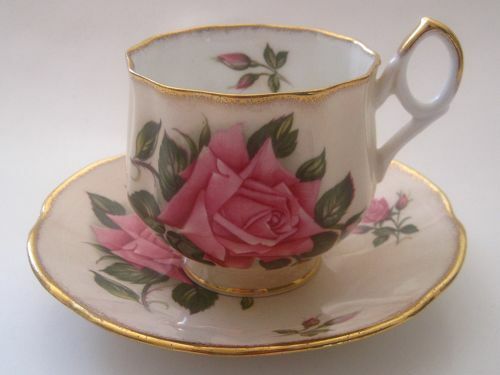 If you'll send me your snail mail address via the e-mail button at right, I'll get the chintz teacup headed your way. Congrats! 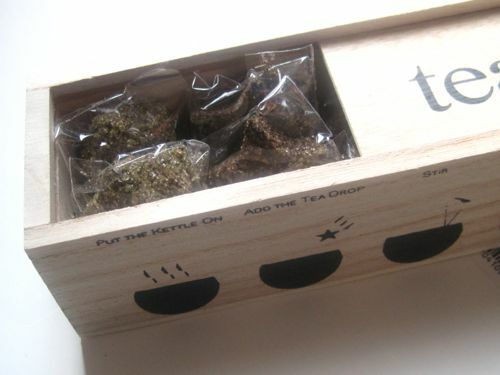 A fun (and delicious) new way to enjoy tea! 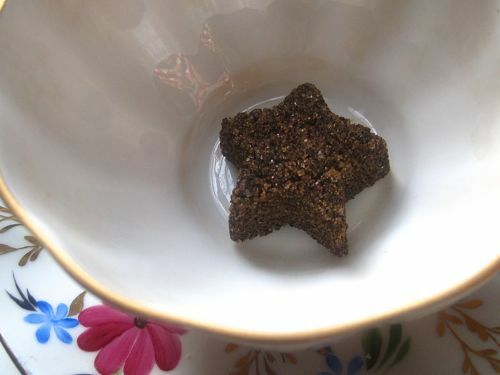 It is rare that someone comes up with a truly new way to enjoy tea, but when Sashee Chandran wrote me recently about Teadrops and offered to let me try a sample, I was more than a little interested! A Teadrop, she said, "is a literal morsel of finely sourced tea, spices, and organic sugar that one simply drops in hot water and stirs to enjoy." My samples soon arrived, and I was impressed with the pretty wooden box packaging them. Each flavor of tea is a different shape. From left are the Vanilla White tea, which is bundt-shaped, the Rose Earl Grey tea, which is flower-shaped, and the Cardamom Spice tea, her most popular flavor, which is star-shaped. When I turned over the box, I was intrigued to see that it says these are "Made in a Home Kitchen" and even listed the permit number. I like that! 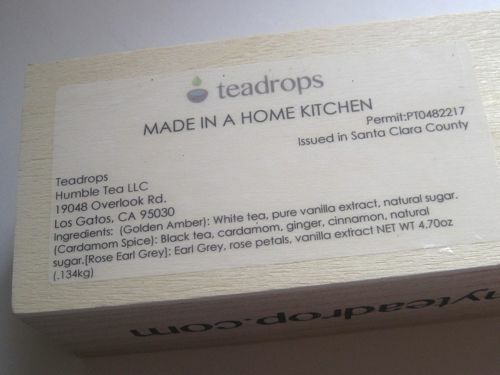 I was very curious how these Teadrops could possibly "work," because it seemed to me those finely ground tea leaves would be swirling around my tea and I'd need to strain them out. But the video I watched said no, no straining was required. How was that even possible? I added the boiling water to my cup and watched closely as some tiny bubbles formed near the surface. 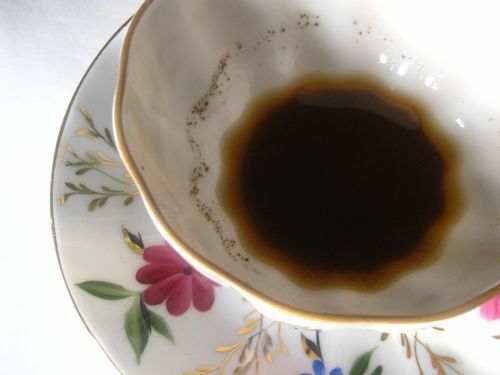 When I stirred the tea, its look suddenly reminded me of the popular homemade powdered tea mix many of us have tried over the years. (And yes, it's a bit creepy that you can see my little blue camera and my fingers reflected in the tea. Thank goodness I painted my fingernails this weekend!) The Cardamom Spice tea was the first one I tried, and I must say I just snuggled under an afghan and sipped away, thoroughly enjoying the spicy goodness. It was a perfect treat for a cold winter afternoon. Then I tried the Vanilla White tea, which had a much more subtle taste, but I loved the rich vanilla flavor of it as well. Last, I tried the Rose Earl Grey, and again I was impressed that these magical, pretty Teadrops could result in such a tasty cup of tea! So where do the ground tea leaves go? Apparently at least some of them sink to the bottom as you drink the tea, and I was so very surprised that I didn't once taste anything but liquid tea. How neat is that! 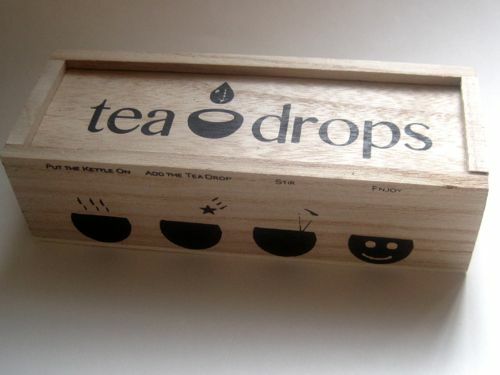 I can only conclude that these Teadrops have been magically engineered to provide this elegant new way of enjoying tea! 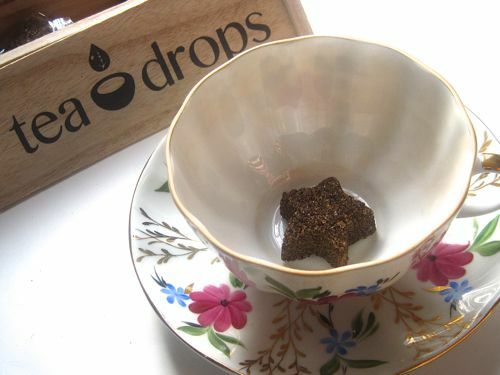 I'm so happy I got to try these Teadrops, and you can learn more about them yourself by going here! On Monday we observe Presidents' Day, which was originally established in honor of the birthday of our nation's first president, George Washington. His actual birthday is February 22, a date I always find easy to remember because it's my Daddy's birthday too! (And his middle name is George; I like to think my grandparents were trying to make it easy on those of us who needed help remembering birthdays.) 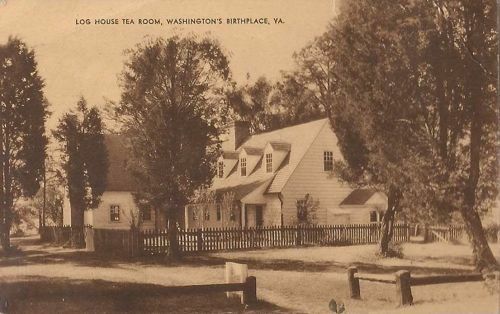 So in honor of President George Washington, I thought I'd share this postcard of the Log House Tea Room at Washington's Birthplace in Virginia. ADDITIONAL INFORMATION FROM A READER! As an amateur genealogist, cannot resist the challenge of trying to fill in some of the blanks left by brief postcard messages! Although the recipient's name does look like Borrows, in all records she appears as Barrows. She was Mary Barrows, the widow of Willard F., living with 2 sons and her occupation in 1940 was dressmaker. 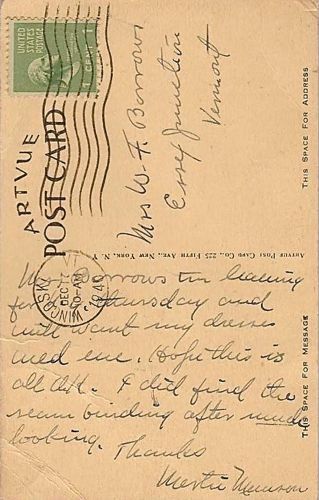 The postmark is from Winooski, VT so who knows when (or even if) Mertie went to the Log House Tea Room! The date sent looks like Dec 17, which was a Tuesday in 1940. Hope the seam binding wasn't for those dresses as it is kind last minute if she wants them by Wednesday! Cynda P.! I've got your address, Cynda, so I'll get this tray headed your way ASAP. Congrats! 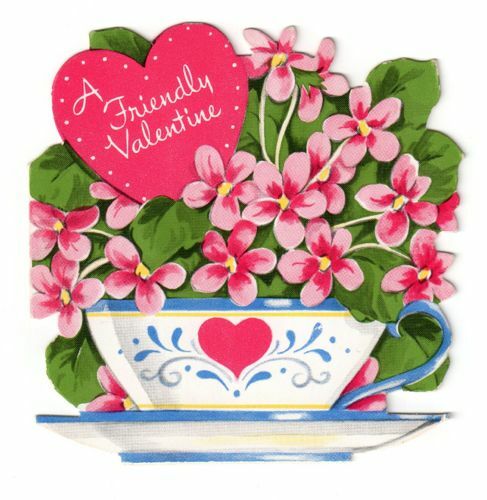 This "Friendly Valentine" is one I find just darling, so I saved it for today to wish you all a very, very Happy Valentine's Day! 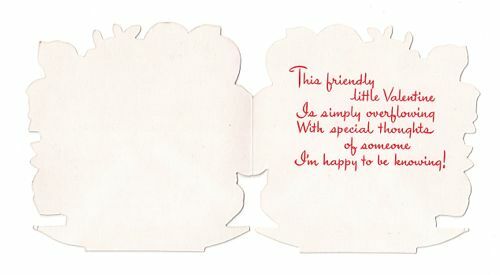 It says, "This friendly little Valentine, Is simply overflowing, With special thoughts of someone, I'm happy to be knowing!" 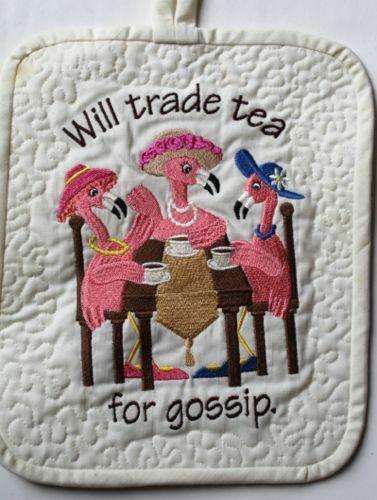 And that's certainly how I feel about all of you tea friends reading today! 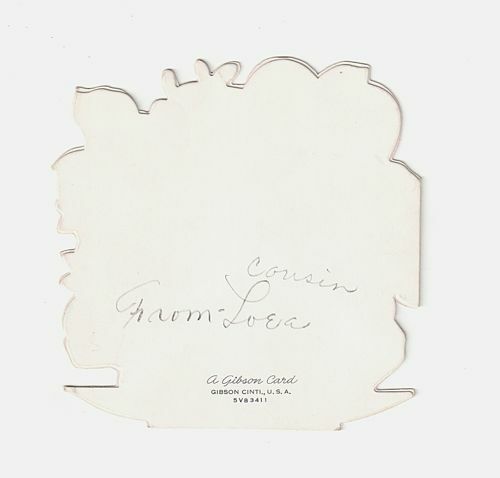 This card is signed on the back, curiously, and that name ... is it cousin Loea? If so, that's certainly a new one to me! 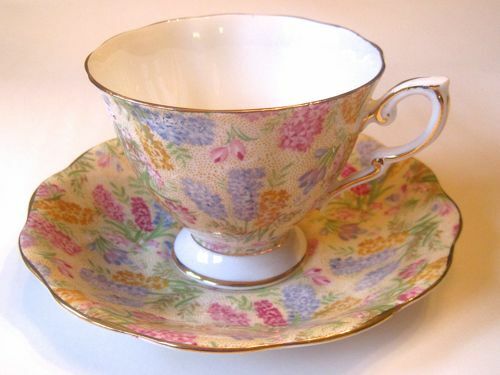 For our final giveaway of Valentine's Week this year, I thought I'd end by offering this vintage English chintz teacup, marked "Royal Mayfair," because it seemed a nice floral match for today's flowery vintage Valentine! 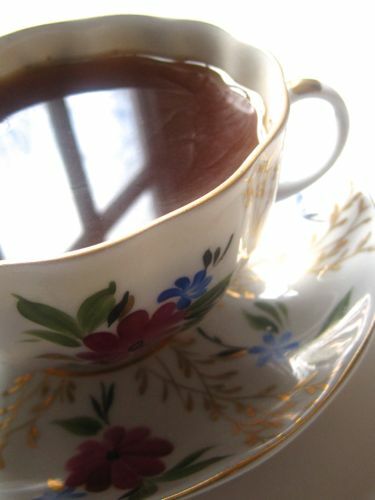 If you'd like to win this teacup, just leave an "Enter me" to this post between now and 7 a.m. EST Monday, Feb. 17. Also, please make sure I have your e-mail address or some way to get in touch with you if you're the winner! Giveaway open to residents of U.S. and Canada. Good luck! Valentine's Giveaway #4 goes to ..
Lipton Iced Teas ... in winter?